For this Sunday Funnies assignment, I mapped Ani’s Tracing Persepolis project. 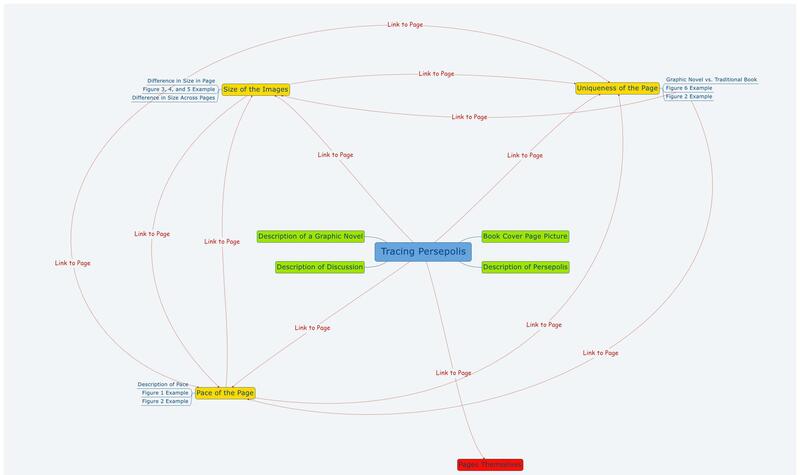 This includes a visualization of the path of the hyperlinks and the main ideas for each page of her project. In my Tracing Persepolis Project, I focused on two particular pages that I traced individually. Because Persepolis is a graphic novel, I made sure to keep the majority of the focus on what the drawings depict than the text. Although, I made sure to connect what I saw from the drawing to the content. While taking a moment to concentrate examining the uniqueness of the pages that I traced, I found that they gave so much more significance than from reading it for the first time. The use of graphics, had much more expression to get her meaning across than if it were completely in text. Initially I chose the pages that I would later draw, because I knew that they were distinctly contrasting events from the story but it had soon started to unfold after tracing that their were unique differences in the how the panels were designed and structured to get the message across. The facial expressions of the characters, size and structure of the panel(s), and the styles of the settings’ designs all offer aid in better comprehending her story which were goals I got out of doing the assignment. Work Cited: Satrapi, Marjane, and Marjane Satrapi. The Complete Persepolis. New York: Pantheon Books, 2007. Print. I mapped Sam’s Tracing Persepolis! If you would like to see his work click here. If you would like to see the prompt for this assignment click here. Now that I have finished my first draft of the Tracing Persepolis project, I want to take a moment to reflect on my work. First off, I underestimated the time it would take me to complete the project. This was not necessarily a bad thing; in fact, it forced me to think critically about the text. I never realized how much I could learn from two pages of Persepolis until I took a few hours to trace them. My main goal for the project was to explore Satrapi’s purpose in writing her memoir. This specifically meant diving into the themes and style of each page I traced. I feel as though I grasped the most important ideas from each page as I was writing my project pages. Please feel free to leave a comment with your opinion. You can check out the original assignment here. The project of tracing Persepolis proved to be much more difficult than I had expected. At the beginning of the project I wanted to do a feminist reading of the novel focusing on two main themes Satrapi’s Iranian identity and the restraints that she had as a woman in Iran. However, when I began to write the pages I found that these topics were too narrow. I decided then to contrast the personality of the protagonist when she was an adolescent and when she was a full grown adult. In order to incorporate the themes that I wanted to explore originally, I created two subpages, one focusing on the theme of the East vs. the West and another discussing the social restraints of women in Iran. Another difficult part of these project was the tracing of the pages. It was impossible to do a clean trace. I also found myself repeating the same themes on multiple pages, it was hard to treat the different topics individually. To try to overcome this, I wrote the analysis and stopped working for an hour or two; after which I would do further revisions. This technique was somewhat successful. In the end, I was very satisfied with the first draft of my project. The uniqueness of the page. The pace (or flow) of the page. The size of the images on the page. My project is intended to be very circular. In order to get the full understanding of the way Satrapi used her graphic novel one must visit all three of my subpages. From each pages, the reader should be able to easily navigate to the images being discussed, as well as link between the different pages. Additionally, I used considerable explanation at the beginning of each of my subpages, even though there is not considerable relation to the book. I think this serves as a crucial balance between writing for someone who has read the book, as well as someone who might just click onto the page. Finally, I found it challenging and yet enjoyable trying to write for an online audience. It was engaging trying to write in a way that was different from what I was used to, but it was challenging still maintaining a sense of academia (ultimately the reason why I wrote it). I hope was able to strike a reasonable balance. I tried to focus more on the message I was trying to send, and less on how I was going to be graded, in order to allow the thoughts and ideas to come to me. Now, I can revisit the idea and see if I was as successful as I thought. This Tracing Persepolis project allowed me to see how graphic novels can enhance a reader’s experience. I had never read a graphic novel before and had some reservations. After reading Persepolis, I could definitely see how the illustrations in the novel helped my understanding of the overall work. In my project, I found it difficult to decide which pages I wanted to trace and what aspects I wanted to include. I tried to capture the characteristics of the page that stuck out to me, while still being able to connect to the other tracing. Another task I found challenging, was deciding how to divide the panels and arranging them on different pages. This was easier to do after I did my synthesis and reflection. Overall, this assignment was difficult, but it was interesting because I had never done anything like it. This was one of the most interesting assignment I have been assigned in any English class. I have always been a fan of reading comics (Japanese manga to be more specific), and this class gave me an opportunity to look into something that I’m very interested in through the scopes of academics. Tracing pages of Persepolis allowed me to reflect on the details of the techniques that author uses to evoke certain emotions out of the reader, to emphasize a certain point of the story, or simply to spice up the reading experience in general. At first, it was hard for me to find the features and techniques that Satrapi has used. But through thorough readings, about 3 to 5 pages before and after the traced pages, I was able to extract the salient features in the page that I chose to trace, figure out the context and the significance it has on the overall plot. The Tracing Persepolis project helped me better understand how graphic novels can affect a reader’s experience and better their understand of the story. My main goals for this assignment were to analyze the sizing and placement of panels, facial expression of characters, and shading techniques used on two pages of the novel. I analyzed how these features created visual tension between the two. I found it challenging to pick two uniquely different pages that contained these three features of a graphic novel. After I choose my two pages, I found it challenging to choose which characteristics of the images to include in my tracings in order to emphasize my analysis. I tried to include parts of the image that stood out to me in a way that affected my interpretation of the page. What makes Marjane Satrapi’s, Persepolis, so unique is her decision to tell her story through a graphic novel format. I explored how three features of a graphic novel allow the reader to create new associations in and among the panels that would not have been possible through a traditional prose. Before starting my project, my goals were broad–I wanted to make a collection of pages and subpages that could be fairly easily and logically navigated through, and I wanted to accurately capture the emotions behind the sketches I chose to analyze for my assignment. Since Persepolis is a graphic novel, it seems to me the graphics are a major component of understanding and even experiencing the story. Thus, I wanted to focus on what the images were telling the reader that the reader could not necessarily get from the actual dialogue and text. The challenges I faced when tackling this assignment were mainly while tracing and preparing for my analysis. I traced the pages with pencil and it was hard for me to maneuver the paper while avoiding smudging the lead and thus making the tracings fuzzy. However, to solve this, I tried to go erase all the smudge marks on the tracing paper before I scanned them. Another problem I faced was when adding the gutter text, I realized it was easier for me to write on the tracings electronically. However, I had already drawn the sketches to include dialogue and caption bubbles so when I added my gutter text, I couldn’t get the text to overlap with those drawn bubbles well. To solve this, I decided the gutter text was more important than the sketches looking more precise, because the analysis is my own work, whereas the sketches were traced from someone else. Also, after adding all my gutter text, I didn’t realize if I clicked save, I could never edit any of the gutter text, because it was no longer recognized as a text box. So the gaping “mistake” in my sketches is on one of the pages, there is a white chunk of scanned paper missing and then a next text box over this. That is because the only may I could figure out how to edit the text (after many, many missed attempts), was by cropping that text out of the image and writing over it. However, overall I think the project went well. Click here to read about the overview of the assignment. Click here to view my completed assignment.